Protein populations rise and fall from tissue to tissue and from cell to cell as organisms develop and do what they must to maintain health—or regain it, should they suffer illness—and each fluctuation, alone or in the context of other fluctuations, may serve as a signal, an indicator of an underlying dysfunction, a sign that an intervention is warranted, or evidence that an intervention is already having an effect. Taking the measure of protein populations is the essence of protein profiling, a venerable practice that is growing in sophistication as it becomes more proteomic in character. In fact, the phrase “protein profiling” is used synonymously with “proteome profiling.” Arguably, though, protein profiling is the more general term, since a protein profile that encompasses a subset of the proteome may suffice for a particular purpose. Besides generality, “protein profiling” has the advantage of modesty. It may be taken as an admission that even the most extensive protein profiles are more sensitive to some proteins than others. In any case, some corners of the proteome remain dark. While protein profiling may lack proteomic omniscience, it is demonstrating a proteomic outlook. It is part of a shift from protein identification to protein quantification, the measurement of protein expression levels. Moreover, protein profiling now encompasses protein structure-function relationships and protein-protein interactions. Protein profiles may reflect not only the fluctuations in protein levels, but also the shifts between active and inactive protein forms. As always, protein profiles are about comparisons—diseased vs. healthy, treated vs. untreated, experimental vs. control—but now the comparisons have more depth. They are like census-based analyses that substantiate increasingly fine demographic distinctions. 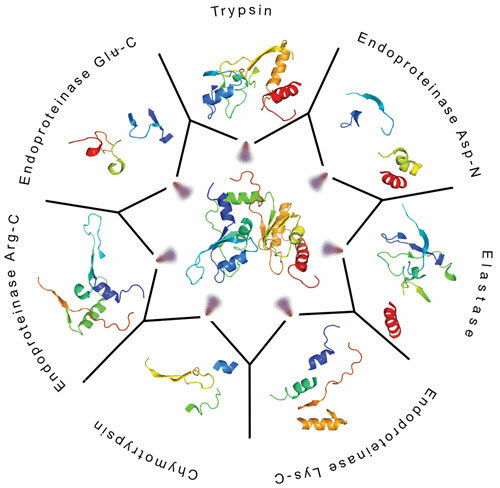 Protein profiling is becoming more refined through the use of advanced experimental and analytical approaches, several of which are summarized here. “A key limitation at the moment is that we are constrained by the number of proteins that we can measure by flow cytometry in a single cell,” says Berthold Göttgens, Ph.D., professor of molecular hematology at the University of Cambridge. Current flow cytometry approaches allow only up to 20 to 30 protein species to be simultaneously profiled in a cell, and the technology typically provides a snapshot of cellular information. maker proteins. In stem cell biology, population-level profiling provides only population averages and is uninformative about the biology of single cells. The importance of capturing single-cell processes, increasingly recognized in many areas of life sciences, is particularly critical for stem cell research, where progression between distinct cellular states is fundamental for understanding the biology and for developing therapeutic interventions. By taking advantage of recent molecular-profiling technologies, Dr. Göttgens and colleagues interrogated early hematopoietic stem cell differentiation at the single-cell level in mouse hematopoietic progenitor stem cells. Surface-based cell sorting was used to retrospectively assign cells to one of twelve different phenotypes. “From these same cells, we also recorded mRNA expression for the entire transcriptome,” details Dr. Göttgens. This helped link single-cell gene-expression profiles with single-cell function. An online repository that incorporated the data provided a resource to visualize lineage-specific transcriptional programs and helped generate an atlas of the early hematopoietic stem cell differentiation at the single-cell resolution. “Linking molecular profiles with surface marker profiles enabled us to detect protein expression levels without the need to lyse the cells,” explains Dr. Göttgens. Measuring surface protein markers and gene expression in the same single cells, and connecting the two, allowed investigators to use the surface markers to specifically purify distinct populations of cells. “Undoubtedly, the biggest challenge in comprehensive or global protein profiling is the dynamic range,” says Hamid Mirzaei, Ph.D., assistant professor of biochemistry at the University of Texas Southwest Medical Center. For the cellular proteome, the dynamic range fluctuates from one copy to about ten million copies per cell, and it also varies with the experimental system, with major differences being seen between cell lines and biological fluids such as plasma. Major efforts in Dr. Mirzaei’s laboratory are focused on drug discovery, and these experiments, mostly conducted in cell lysates as experimental models, are seeking to understand the binding sites of specific drugs and their interactions with proteins. Other efforts in Dr. Mirzaei’s laboratory are focused on biomarkers. The majority of Dr. Mirzaei’s biomarker work is performed in plasma. The difference between the dynamic range of plasma and that of cell lysates is estimated to be about five orders of magnitude. “This is one of the factors that makes it so difficult to profile proteins in the plasma,” explains Dr. Mirzaei. For example, a peptide that originates from a highly abundant protein may mask peptides that come from a low-abundance protein, and estimates that the 22 most abundant proteins represent about 99% of the plasma proteins illustrate the challenges posed by the dynamic range. Most proteins that are expressed in different tissues reach and reside in the plasma, where their measurement provides prognostic or diagnostic value. Protein profiling is critically positioned for biomarker identification and development. “Post-translational modifications of proteins are potential biomarkers, as opposed to a proteins themselves,” asserts Dr. Mirzai. In recent years, there has been increasing interest in profiling post-translational modifications, and efforts are underway to significantly improve the ability to visualize lower abundance proteins that carry those post-translational modifications. 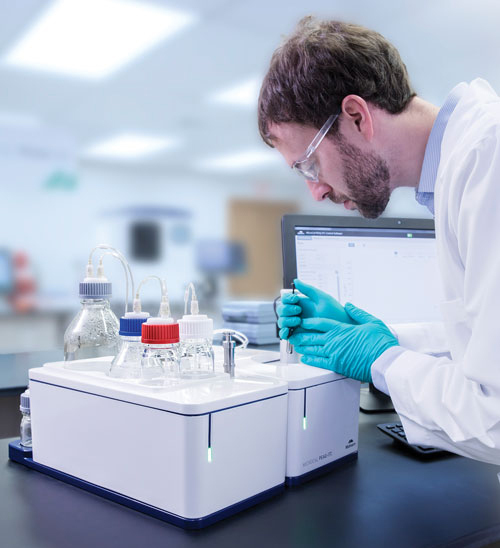 Malvern Instruments’ MicroCal PEAQ-ITC was developed for drug discovery applications such as hit validation, lead optimization, and assay development. In one recent study, Dr. Elledge and colleagues used quantitative mass spectrometry to capture the substrates and the signaling pathways involved in the cellular response. The scientists generated an unbiased database of phosphorylation targets that contained 133 substrates and was enriched for proteins involved in DNA repair, DNA replication, translation, and cell cycle control. This work helped uncover the central position that the DNA damage response occupies in the vast cellular signal transduction network and in cellular metabolism. In addition, the work revealed links to TOR signaling, inositol phosphate metabolism, and translational regulation. “The limiting factors in capturing phosphorylation events will always be sensitivity and the quality of the calls,” advises Dr. Elledge. “And these factors depend on how much material can be obtained.” Obtaining sufficient material for mass spectrometry is particularly critical when profiling post-translational modifications. For certain post-translational modifications, such as phosphorylation, profiling has been facilitated by the availability of affinity reagents. “Affinity reagents allow investigators to profile the proteome at a much deeper level,” explains Dr. Elledge. In a study that profiled ubiquitination in response to the DNA damage response using quantitative proteomics, Dr. Elledge and colleagues reported that the replication protein A (RPA) complex is ubiquitinated at multiple sites. The RPA complex is a protein scaffold that binds single-stranded DNA generated during replication fork stalling and facilitates repair. In mammalian cells, RPA complex ubiquitination is required for homologous recombination at stalled replication forks. The budding yeast and the baker’s yeast, two experimental systems extensively used in Dr. Elledge’s lab, provide ideal models to understand the functional relevance of the proteins of interest. These models take advantage of the availability of knockout strain collections that help interrogate the presence of a protein in a specific cellular pathway. “The ability to more sensitively detect peptides is critical,” says Dr. Elledge. “One thing that is missing in mass spectrometry analyses is that this technique can identify only those peptides that already exist in the database.” As a result, a vast amount of experimental data is discarded during mass spectrometry experiments. A multi-protease strategy on the HeLa proteome to improve protein sequence coverage, and to target regions of proteins that do not generate useful tryptic peptides. Recent studies have reported that brusatol, a natural compound, can potently and selectively inhibit Nrf2 activity and sensitize several cancer cell types to chemotherapeutic agents. “We became interested in brusatol after several papers showed that it inhibits the Nrf2 transcription factor,” says David Stokoe, Ph.D., senior scientist in discovery oncology at Genentech. Nrf2, a protein critical for the cellular response to oxidative damage, has dual roles in cancer, inhibiting tumorigenesis in some contexts, and stimulating it in others. These disparate roles are related to mechanisms of activation and dysregulation of the KEAP1-NRF2 pathway. Dysregulation of the KEAP1-NRF2 pathway has been implicated in inflammation and cardiovascular, neurodegenerative, and malignant conditions. Using a mass spectrometry-based strategy, Dr. Stokoe and colleagues interrogated the cellular targets of brusatol in a non-small cell lung cancer cell line. Combining this approach with a cellular thermal shift assay, which exploits changes in the conformation and the thermal stability of proteins when they are bound by small molecules, Dr. Stokoe, together with his Genentech colleagues Kebing Yu, Ph.D., and Don Kirkpatrick, Ph.D., found that brusatol regulates Nrf2 by an indirect mechanism that involves a global inhibition of protein synthesis. While the expression of most proteins from the proteome decreased, the expression of ribosomal proteins increased, suggesting that brusatol could decrease Nrf2 protein levels by modulating translation. Brusatol decreased the expression of many proteins; notably, proteins with a short half-life were the most powerfully impacted ones. This result validated thermal proteomic profiling by mass spectrometry as a new strategy for target identification and characterization in drug development. Recent years have witnessed the emergence of additional experimental strategies for protein profiling. “There is a lot of excitement about protein activity profiling, where instead of looking at protein abundance one actually interrogates protein activities,” elaborates Dr. Stokoe. Protein activity profiling, which can globally characterize the activity of enzymes in their native environment, relies on the use of a probe that binds the active site of an enzyme, and has been successfully used for enzymes that can be covalently labeled. “This strategy has been used for phosphatases, deubiquitinases, and other proteins with an available cysteine molecule,” notes Dr. Stokoe. “It will be an emerging area as we move forward.” Another promising strategy for protein profiling is chemical proteomics. With this strategy, a functional group is attached to a small molecule, and then the proteins that it binds to are interrogated. A key determinant in the outcome of protein profiling experiments is the amount of protein that is available for analysis. This determinant depends on multiple variables including the cellular abundance of the protein, the nature of the samples that are to be interrogated, and the capabilities of the experimental approach that is to be used. For example, if mass spectrometry were to be used, ionization efficiency would be a relevant factor. Protein profiling is also challenging because of the dynamic nature of proteins. Proteins have a wide spectrum of half-lives. Also, proteins change in abundance and alter their interactions with binding partners in response to their environment. “Being able to measure proteins under representative conditions, and to know that the tests carried out will produce representative data, is crucial,” explains Dr. Newey-Keane. Malvern Instruments recently launched a new platform that combines Taylor dispersion analysis and ultraviolet detection for molecular sizing. This approach provides automated protein and peptide stability measurements, has ultra-low volume sample requirements, and is ideally positioned to dynamically characterize proteins, even in complex media. Many of the proteins that are interrogated in biological fluids present promise as biomarkers or for therapeutic interventions. In translational research, the ultimate goal is the ability to transition from the bench to bedside in a manner that is safe and therapeutically effective. The dynamic characterization of proteins is an instrumental step during this process.